Art Storage rolls on wheels that lock in place. Art Storage Shelves adjust in height. Additional parts are ordered as needed to expand the Art Storage to any size. 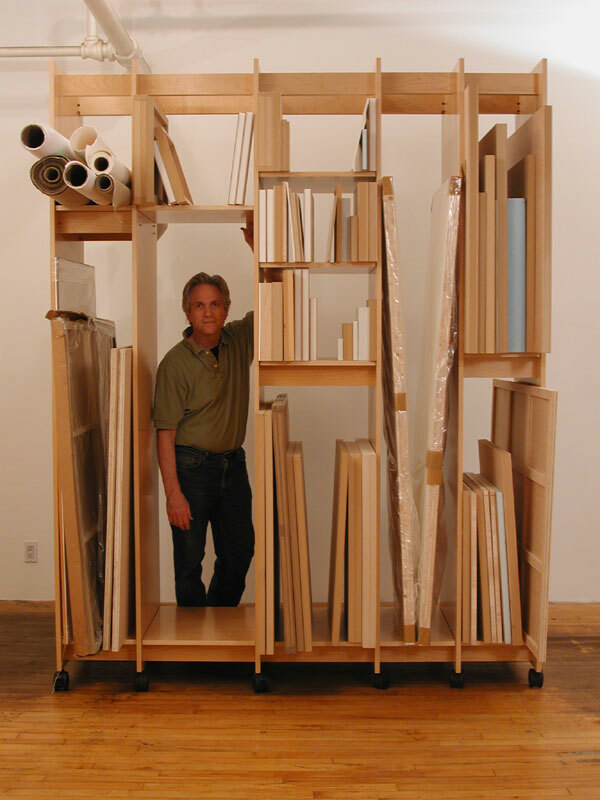 Art Storage walls can be cut down to any desired height at no additional charge. Click on the drawings below for more detailed information on sizes, and prices. 12", 12", 12", 12", 12". 12", 12", 12", 12", 18". 12", 12", 12", 12", 12", 12". 12", 12", 18", 18", 18". 12", 12", 18", 12", 12", 12". 12", 12", 18", 18", 12", 12". 12", 12", 12", 12", 12", 12", 12"
18", 18", 18", 18", 12", 12". It is a modular system that can be expanded in size at any time. Additional sections, shelves and parts are ordered as needed. Art Storage parts can be added in the future and are guaranteed to fit. It rolls on wheels that lock in place or it can be stationary with leveling feet. The Art Storage System is made of furniture grade maple plywood. The Art Storage System is coated with a durable acrylic satin lacquer. The clear satin lacquer creates beautiful protective finish. There are no formaldehydes added to the lacquer or the maple.